DPS3005 is 30V, 5A adjustable power supply. It has great options as is: over-voltage protection, over-current protection and overpower protection. This setting is for maximum ratings that you apply before anything else. 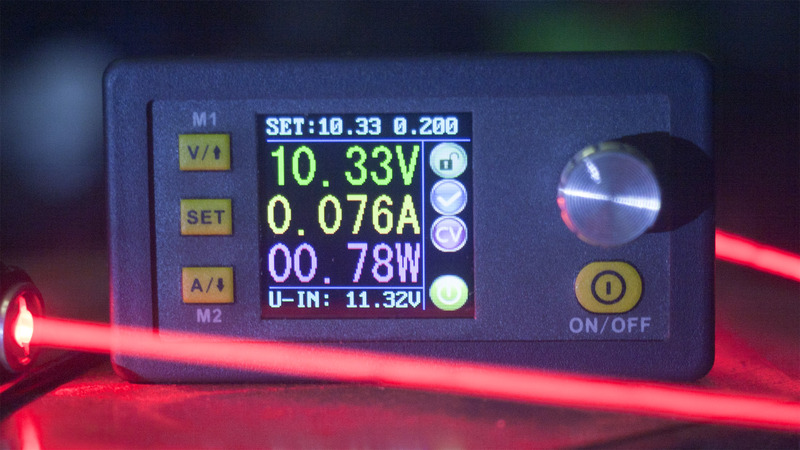 For example, if you read datasheet for some electronic product, and it says has some maximum voltage and/or current ratings, you may set this values as a maximum values – where PSU will cut off power in the case that those limits are reached. Input voltage should be 1.1 V above maximum wanted voltage, but not less than 6 V. Absolute maximum voltage should be no more than 35V. So, when constructing power supply, transformer with rectifier and filter capacitors (electrolytic capacitors) should not go over that value of 35 volts. In the case of 35 V input, it can give us little bit over 32 V output. For those who want higher voltage, there is another model: DPS5005, which gives up to 50 V (little bit more). Both are 5 A output capable. Just provide ‘+’ and ‘-‘ wires at +Vin and -Vin, then connect wires for the output at +Vout and -Vout, and that is all. Output ripple voltage is 100 mV peak to peak. It can be further filtered by external capacitors, for example 100 nF + 100 uF capacitors paralel to Vout connectors. Ripple voltage is at relatively high frequency (not 50/60 Hz), thus easy to filter out. Some inductive coil (choke) can be added in series between Vout connectors and capacitors mentioned above for even better filtering. DPS3005 is very good protected device – even repeated short circuit at output is tolerated. For most application we want constant voltage. Just pres yellow button with V/up (arrow up), then rotate dial. Dialing button has option to select precision of increments, so push button and select steps at which it will change numbers on the display: 0.001 V, 0.01 V, 0.1 V, 1 V or 10V steps. If there are no over-voltage event, it will work fine. Sometimes we need constant current limitation. The same steps as with Constant voltage, but this time bottom yellow button pressed to chose constant voltage settings. There is no such thing per se, but rather interesting way to protect circuit from over-voltage, over-current and over-power protection. In the menu, selected after pressing yellow ‘SET’ button, using arrows (also yellow buttons up/down), there are options to set ‘OVP’, ‘OCP’ and ‘OPP’ protections. OVP is for over-voltage protection – sometimes may happen that our circuit is connected to other PSU, and ‘back-fire’ some higher voltage out, so this OVP will react and turn off PSU. OCP reacts exactly as circuit breaker, which just turn off peacefully whole PSU. OPP is new thing – it calculates power based on formula P=I*U (power equals current multiplied by tension), and reacts depending of our settings in the menu for OPP. It is cheap and affordable PSU. Only what you need to add is some transformer with rectifier and filtering capacitors, or as I did use another existing non-regulated PSU and you have really good regulation, protection and accuracy. Accuracy is about 0.1% which is really good for prices less than $30 US – on Banggood, DPS3005, or DPS5005 version.